Brazilian President Jair Bolsonaro has undergone surgery to reverse a colostomy he had performed after being stabbed in the stomach on the campaign trail in September. He is expected to be on strict bed rest for two days after the operation, a presidential spokesman said. Vice-President Hamilton Mourao has taken over the president's duties for that length of time. Doctors in Sao Paulo said the surgery lasted nine hours; Mr Bolsonaro is expected to make a full recovery. He is expected to stay in the hospital for 10 days. A colostomy bag is a small pouch used to collect waste from the body when the digestive system is no longer functioning a result of an illness, injury or problem. The 63-year-old president checked into São Paulo's Hospital Israelita Albert Einstein on Sunday to undergo tests before the surgery. 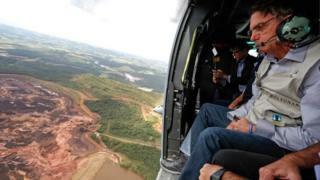 The Brazilian leader posted a video of himself dressed in a hospital gown, discussing recent events, including his flight over the mining disaster site in the town of Brumadinho in Minas Gerais. A dam burst at a iron ore mine on Friday, releasing a torrent of mud that killed at least 58 people and left hundreds missing. A police investigation has concluded that Mr Bolsonaro's attacker, Adelio Bispo de Oliveira, was politically motivated.